Discover some of Scotland’s highest-rated tourist attractions with these Google Maps that explore the main cities and their surrounding areas. There’s a wide range of included attractions in each map and you’ll find everything from castles to museums and galleries to parkland. Happy exploring! …or click here to find my recommended tourist attractions map and reviews. Aberdeen, in the north-east of Scotland, is the country’s third largest city by population and has been settled for at least 8000 years thanks to the fertile lands around the River Dee and River Don. The city is famed for its granite buildings which led to its nickname ‘the granite city’, and although it’s best known in Scotland as being the country’s foremost oil and gas capital there are plenty of tourist attractions for visitors to enjoy both in the city centre and in the surrounding areas. This Google Map highlights tourist attractions in the city of Aberdeen and the surrounding area. Dundee is Scotland’s fourth largest city and is highly regarded both for the quality of its universities and as an important trading port. The city lies in the eastern central lowlands on the north bank of the Firth of Tay and has a rich history associated with the sea, with many historic attractions to be found along the waterfront near the city centre as well as more modern attractions – with the V&A Dundee being one of the highlights. This Google Map highlights tourist attractions in the city of Dundee and the surrounding area. Edinburgh is Scotland’s capital city and arguably its most popular tourist destination, with around 4 million visitors coming to the city each year. Situated on the banks of the Firth of Forth on Scotland’s south-east coast, Edinburgh is the seat of the Scottish government and the primary residence of the nation’s monarch. The two oldest areas in the city – the Old Town and the New Town – have both been designated UNESCO world heritage sites and feature a huge number of attractions, including Edinburgh Castle and Holyrood Palace. This Google Map highlights tourist attractions in the city of Edinburgh and the surrounding area. Glasgow is the most densely populated city in Scotland and has the third highest population in Britain. 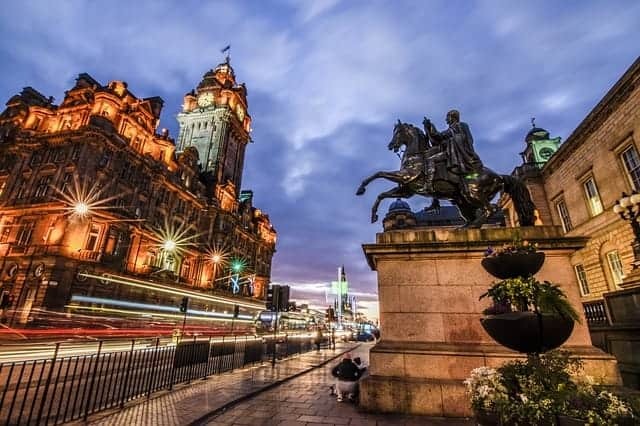 Located on the country’s west coast and bordering the banks of the River Clyde, Glasgow has a rich industrial heritage and features several world-class tourist attractions including Kelvingrove Art Gallery and Museum and Glasgow Cathedral. The city also has a vibrant social scene with some of the country’s best restaurants and bars located throughout the city centre. This Google Map highlights tourist attractions in the city of Glasgow and the surrounding area. Inverness is the northernmost city in Britain and is regarded as the capital of the Highlands, with the very attractive Moray Firth bordering it on the north and the equally pretty River Ness on the south. The city is frequently described as the happiest city in the UK, perhaps due to its location in one of the most beautiful landscapes in Scotland. While much of the old industries have been replaced by tourism, the city retains its quiet charm and is a recommended gateway into the Scottish Highlands. This Google Map highlights tourist attractions in the city of Inverness and the surrounding area. Perth is a city in central Scotland located on the banks of the River Tay that has been settled for at least 8000 years. The city is most famous for the mighty river that runs through its centre and also for nearby Scone Palace where Scotland’s kings were once crowned, and in fact, at one time the city was regarded as the country’s capital. Today however, it’s a bustling market town and is popular with tourists for its many nearby golf courses and woodland trails. This Google Map highlights tourist attractions in the city of Perth and the surrounding area. The city of Stirling is located in central Scotland and is best known as being a former royal stronghold and capital city, primarily due to Stirling Castle which dominates the landscape. Surrounded by farmland, this city is regarded as the southern gateway into the Highlands but is a popular tourist destination in its own right due to its central location between Glasgow and Edinburgh and its close proximity to the Trossachs National Park. This Google Map highlights tourist attractions in the city of Stirling and the surrounding area. If you’d like to see any other tourist attractions added to these Google Maps please message me on my contact page.